along other areas - breaking away every day resulting in a rise in sea levels. 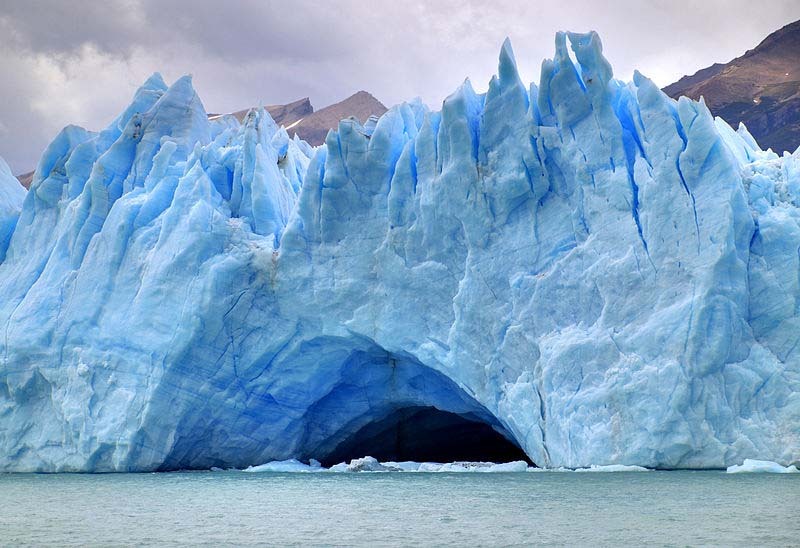 A glacier is a large mass of ice moving slowly over some land surface or down a valley, formed over long periods from the accumulation of snow in areas where the amount of snow that falls exceeds the amount that melts. Glacier ice is the largest reservoir of fresh water on Earth, and second only to oceans as the largest reservoir of total water. Glaciers cover vast areas of the polar regions and are found in mountain ranges of every continent except Australia, although there are glaciers on New Zealand. In the tropics glaciers are restricted to the highest mountains. The processes and landforms caused by glaciers and related to them are referred to as glacial. The process of glacier growth and establishment is called glaciation. Glaciers are sensitive monitors of climate conditions and are crucial to both world water resources and sea level variation. Glaciers slowly deform and flow due to stresses induced by their weight, creating crevasses, seracs, and other distinguishing features. They also abrade rock and debris from their substrate to create landforms such as cirques and moraines. Glaciers form only on land and are distinct from the much thinner sea ice and lake ice that form on the surface of bodies of water. On Earth, 99% of glacial ice is contained within vast ice sheets in the polar regions, but glaciers may be found in mountain ranges on every continent, and on a few high-latitude oceanic islands. Between 35°N and 35°S, glaciers occur only in the Himalayas, Andes, a few high mountains in East Africa, Mexico, New Guinea and on Zard Kuh in Iran. Glacial ice is the largest reservoir of freshwater on Earth. Many glaciers from temperate, alpine and seasonal polar climates store water as ice during the colder seasons and release it later in the form of meltwater as warmer summer temperatures cause the glacier to melt, creating a water source that is especially important for plants, animals and human uses when other sources may be scant. Within high altitude and Antarctic environments, the seasonal temperature difference is often not sufficient to release meltwater. Visualize huge glaciers splitting apart forming a waterway due to climate change. Sounds beautiful ... and yet there is always drama especially when it comes to money. Global warming may be the reason behind rising sea levels, extreme weather conditions and the deaths of Arctic animals. But while the environment suffers, the shipping industry has seen a massive new opportunity. The melting ice is opening up a new trade route through the Arctic Ocean, which China and other countries are planning to benefit from. 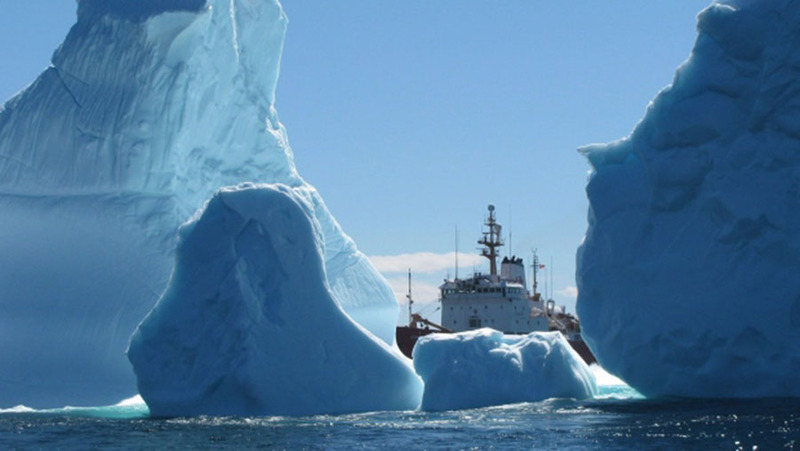 The newly navigable Northwest Passage connects the Pacific Ocean and the Atlantic, and shipping industry leaders in China say the route shortens the journey by 30 percent. But what claim does China and others have on this region? A guidebook produced by China's Maritime Safety Administration (MSA) shows that the People's Republic wants to use Canada's northern waters as a shortcut to the Atlantic. Ships currently have to reach it through the Panama Canal - a route that takes about 40 per cent more time. 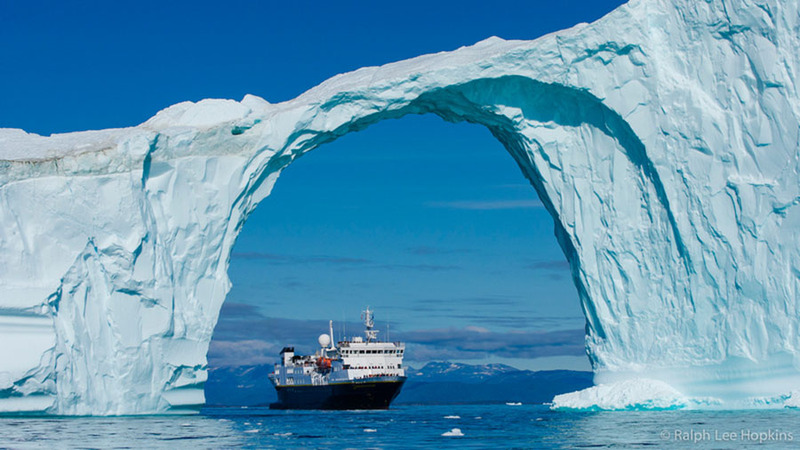 The Northwest Passage is a sea route connecting the northern Atlantic and Pacific Oceans through the Arctic Ocean, along the northern coast of North America via waterways through the Canadian Arctic Archipelago. The various islands of the archipelago are separated from one another and from the Canadian mainland by a series of Arctic waterways collectively known as the Northwest Passages or Northwestern Passages. The Parliament of Canada renamed these waterways the "Canadian Northwest Passage" in a motion that was passed unanimously in December 2009. A new study has found ground-breaking evidence from an ice core in the Swiss-Italian Alps that proves the 7th century switch from gold to silver currencies in western Europe actually occurred a quarter of a century earlier than previously thought. The findings will have major implications on the history of the European monetary system, and what we thought we knew about trade and the economy during this period. The long-standing dating of all events and archaeological remains linked to the old dating of the first silver coinage will also have to change in light of the new study. During the second half of the 7th century AD the coin-using regions of North West Europe switched from gold to silver currency. This change was a significant point in history and resulted in major social and economic transformations which saw increased long-distance trade and the emergence of major ports and trading centres, such as London and continental counterparts around the Channel and southern North Sea coast. A close-up view of the rift separating Pine Island Glacier and iceberg B-46, as seen on an Operation IceBridge flight on November 7, 2018. Wednesday's flight plan took the IceBridge team over Pine Island Glacier as part of the long-running campaign to collect year-over-year measurements of sea ice, glaciers, and critical regions of Earth's ice sheets. The giant berg may not last long - NASA said 'satellite imagery and the IceBridge flight showed that the main iceberg is already beginning to break up. An international research team used a computer model to reconstruct the history of glaciation in the Alps, visualizing it in a two-minute computer animation. The simulation aims to enable a better understanding of the mechanisms of glaciation. Glaciers in Greenland and Antarctica are losing ice at alarming rates, and warmer air isn�t the only cause. Scientists increasingly agree that warm ocean water is seeping beneath the ice and melting it from the bottom up. It�s a growing problem in Greenland, scientists say, and it may already be the dominant driver of melting glaciers in Antarctica. But while scientists know that warm water is interacting with the ice front in both places, exactly what�s driving it there - and how climate change may be involved - is still an open question. Two frozen bodies uncovered in the Swiss Alps this week are only the latest secret shrinking glaciers around the world have given up. Ice has entombed and then returned numerous objects over the years, ranging in size from dormant bacteria to warplane wreckage. The items are often perfectly preserved, as was the case with this week's glacial discovery: A couple who had gone out to the meadow outside their Swiss home to milk cows 75 years ago - and never came back. Cold, dark, and oxygen-starved, the depths of glaciers are equivalent to the sci-fi of cryo-preservation in nature. The Atlas of Submarine Glacial Landforms has been compiled by an international team of over 250 marine geologists and glaciologists over the last four years. The atlas charts the seafloor of both Polar Regions, and could allow researchers to interpret the history of Earth's large ice sheets, and the effect of environmental changes on the continents. An area the size of the UK is included in the book, showcasing a range of geological phenomena, including iceberg doodles and glacial lineations � ridges up to 10 kilometres long moulded on the beds of glaciers. More than 35 individual landforms feature, ranging from dramatic features in the East Siberian permafrost to trough-mouth fans - enormous sediment deposits that build up at the mouths of the largest glaciers. A small town in Newfoundland, Canada, has become a sudden tourist spot thanks to a new visitor - one of the first icebergs of the season. Canada's CBC News said that over the Easter weekend, the Southern Shore highway near the town of Ferryland was blocked with traffic as photographers - professional or amateur - pulled up to snap the hulking ice mountain. Shocking new images have revealed a massive Antarctic crack has grown 17 miles in the last two months, raising fears it is set to create one of the biggest icebergs ever seen. Since December, the crack on the Larsen C ice shelf has grown by the length of about five football fields each day. The crack has created a chunk of ice half the size of Jamaica which is breaking away from West Antarctica. A network of ancient rivers lies frozen in time beneath one of Greenland's largest glaciers, new research reveals. The subglacial river network, which threads through much of Greenland's landmass and looks, from above, like the tiny nerve fibers radiating from a brain cell, may have influenced the fast-moving Jakobshavn Isbrae glacier over the past few million years. The channels seem to be instrumental in controlling the location and form of the Jakobshavn ice stream - and seem to show a clear influence on the onset of fast flow in this region. Rare and somewhat esoteric. These are the huge pyramids of ice that stand proud of the surface on some glaciers. To date, the phenomenon has only really been seen around the Karakoram mountain region of Pakistan. The Baltoro glacier, which begins life at the very summit of K2, has some particularly fine examples. Up to 25m in height and with widths of up to 90m, their triangular shapes when viewed from a distance give the impression of a flotilla of sail boats. 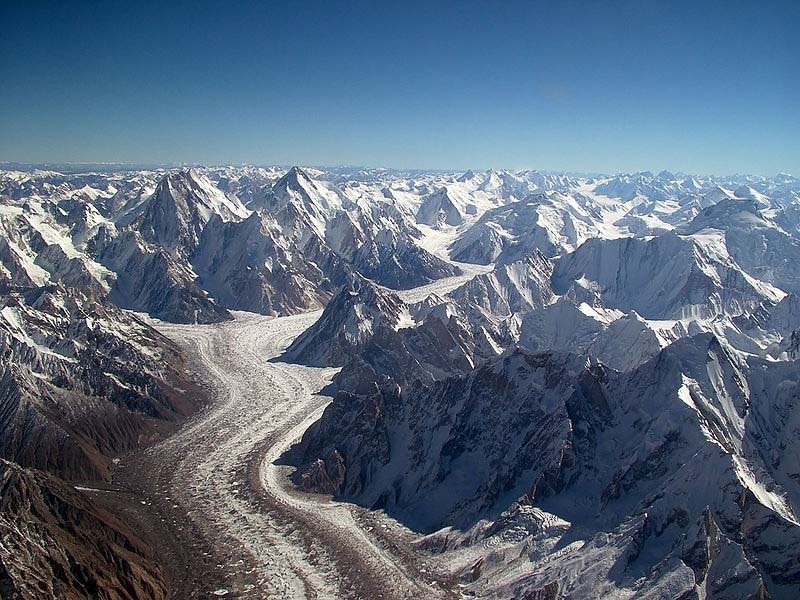 Now, scientists are getting a handle on how these giant "ice sails" form and wither over time, and how the processes involved depend on the special conditions that exist in the Karakoram region. One of the last remaining sections of Antarctica's Larsen B Ice Shelf is dramatically weakening, according to a new NASA study. The study predicts that what remains of the once-prominent ice shelf, a thick floating platform of ice, most likely will "disintegrate completely" before the end of this decade. Ice shelves are extensions of glaciers and function as barriers. Their disappearance means glaciers potentially will diminish more quickly, as well, increasing the pace at which global sea levels rise. The Larsen B Ice Shelf has existed for at least 10,000 years. What matters is how much more ice the glaciers will dump into the ocean once this ice shelf is removed. The glaciers that were behind the vanished section of the Larsen B ice shelf sped up by as much as 8 times their former rate after the ice crumbled over a six-week period in 2002, earlier studies showed. Researchers think the surface warming is melting the ice shelves, triggering a cascade of events that eventually leads them to catastrophically collapse. But recent research also points to melting from below, from warmer ocean water. Scientists are tracking the ongoing changes in the Antarctica Peninsula ice shelves because the collapse could indicate what may happen across the entire continent. glacier melt, scientists report. Researchers in Poland and the UK have found that different types of icebergs have their own acoustic signature as they calve away from the ice. Monitoring this could help to determine how much ice is being lost and the effect this could have on global sea level rise. Using a first-of-its-kind, high-resolution numerical model to describe ocean circulation during the last ice age about 21,000 year ago. Icebergs and meltwater from the North American ice sheet would have regularly reached South Carolina and even southern Florida. The models are supported by the discovery of iceberg scour marks on the sea floor along the entire continental shelf. > The Greenland ice sheet may look like a vast expanse of white, but scientists peering beneath the smooth veil have found a fun house of sorts, full of giant jellyroll-like ice sculptures that could rival city skyscrapers in height and the whole of Manhattan in width. New research has demonstrated again that a comet didn't spark climate change at the end of the Ice Age, killing the Clovis peoples and causing mass animal extinction. Supposed impact indicators are too old or too young to indicate an ancient comet that proponents claim sparked a late Ice Age calamity, according to new research. The researchers found previous dating of Ice Age boundary layers by proponents contained widespread errors. A glacier was still in place in Scotland within the past 400 years - 11,000 years less than previously thought - it has been suggested. The moraines were formed within the last couple of thousand years, which shows that a Scottish glacier existed more recently than we had previously thought.